As a comic reader who reads stuff from five or six different publishers but doesn't dig too terribly deeply into indie territory, I assume that a lot of series I read are at least fairly popular. Most comic readers I talk to have a couple titles in common: Hawkeye, Batman, Saga, Daredevil, Thor: God of Thunder, etc. While those books certainly deserve all the heaping amounts of praise they already receive, the sheer amount of books that come out every week means that there will always be great reads that get buried under the Infinities and Forever Evils. My goal here is to try and promote one of those comics that I feel has been somewhat overlooked. This week, that book is Lazarus by Greg Rucka, Michael Lark, and Santi Arcus that is published by Image Comics. There are a lot of reasons to love this book, chief among them being the creative team. I've been a fan of Rucka and Lark for quite a while, both together and separate. 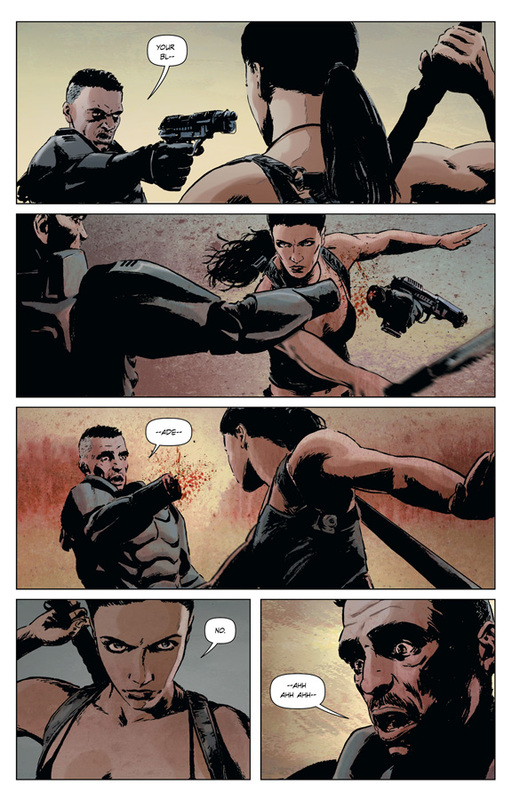 Rucka's writing style, full of realistic but sharp dialogue as well as tightly knitted narratives, has always clicked with me, and Lark's sense of movement and shadow always utterly captivates me. This book seems at first glance to come from a little outside their usual noir/crime wheelhouse: Lazarus is the semi-futuristic story of Forever Carlyle, a woman who was bred and enhanced to be the psuedo-superhuman, almost unkillable enforcer for her family. The world she lives in is one in which countries no longer exist; instead, territories are staked out by powerful families, and there are only three categories of citizen: Family, Serf, and Waste. It's a sci-fi but grounded tale of power struggle and at the center of it is Forever, who we get the sense is not quite OK with the way things are despite her genetic upbringing. 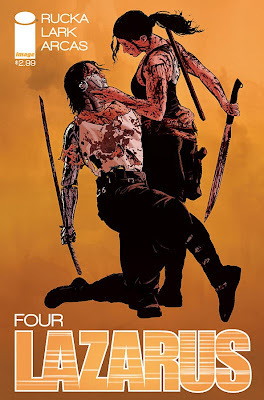 It's got two elements that make it a bonafide Rucka book despite it's semi-futuristic setting: it's got a very strong female lead with incredible depth, and it has some definite military aspects in how the action is structured. Lark is mostly known for his noir stories, which makes him a less obvious fit, but the two of them--along with fantastic, moody coloring from Arcus--continue to make magic together. 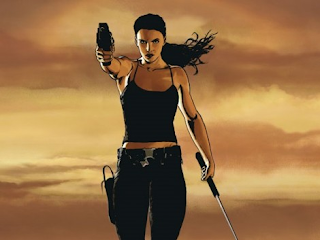 Lark brings to the book a dark and shadowy atmosphere that plays well with the elements of intrigue and assassination, but combined with Rucka's tight scripting the action scenes are extremely well paced and panelled as well. I can't help but mention the excellent back-matter that the book offers as well: Rucka answers letters, but also gives readers weekly updates from the world of genetics and medical technology that make the book's subject matter seem that much more relevant and a bit scary. And in a Mind MGMT-like bit of cramming more information into the empty space, the letters pages also have a running timeline of the history of Lazarus's world along the sides of the page, which really fills out the world of the story nicely. In short, Lazarus has moody art, smart dialogue, subtle writing, and a female character who essentially a superhuman but is ironically quite realistically proportioned and quite smart for a change in a comic. It's a unique read, to be sure, and well worth the $2.99 cover price. Issue 4 (pictured below) is solicited to hit comic shops on October 2nd, and you can bet I'll be on board!